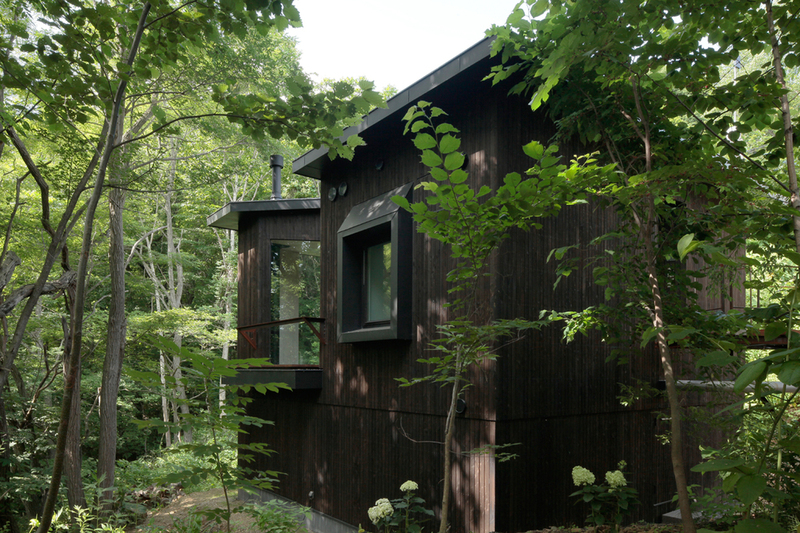 A small house settled on the border of residential area close to Sapporo city central and the forest spreads to the west of Mt. Moiwa. Since the site level is lower than the front road, access to the building across the bridge connects to the second floor. 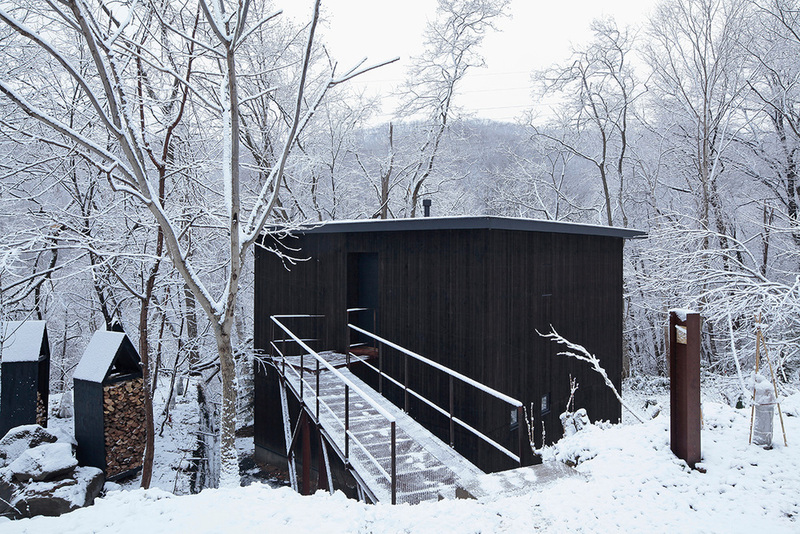 The house has a form close to the cube, with a triangular shape cut out on the east side. 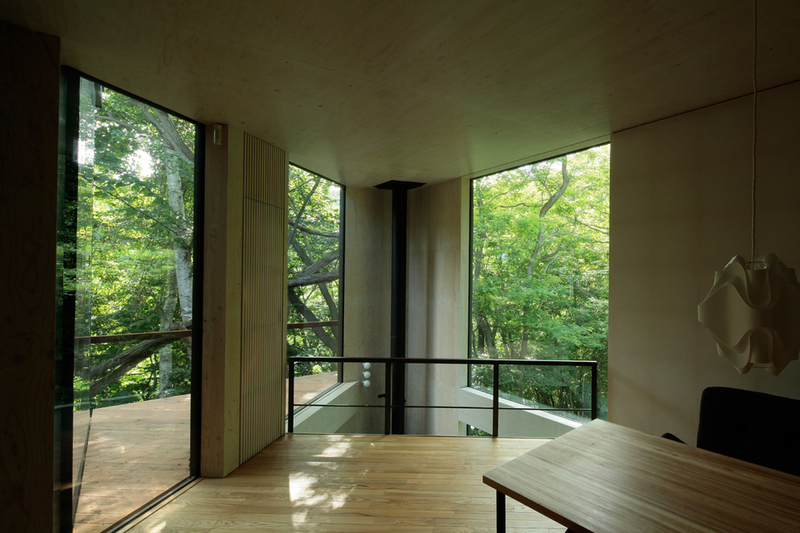 The large glassed openings are placed in this triangular cut out space, and also in the atrium facing the deep forest on the southeast. Having the openings only in these area, and also having various light, differences in floor levels and ceiling heights, all the elements which cause many actions in this house are concentrated in this corner. Our goal was to design a house, where the family come together around this complex phenomenon created by these elements, inside this simple form space. Specifically, overwrapping a primary mechanism of light itself with some secondary phase components appealing to us visually and auditory, and incorporating a confrontation with nature from various angles of eye level such as the birds in the sky and flowers on the ground, which comes from the floor level difference by related to the form of this site. 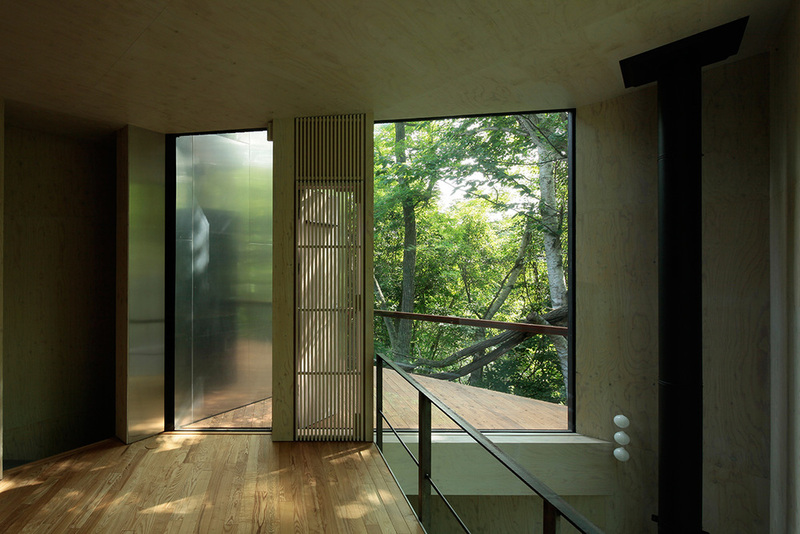 Strong direct light and shadows of the trees through two stories height window in the atrium, indirect light bouncing in from the aluminum wall reflecting the forms of trees and colors of the seasons abstractly, soft transmitted light through a Japanese paper sliding door, and diffused light reflecting off the uneven-polished sloping ceilings. Compositive combination of phenomenons that can occur anywhere, such as the images of real and unreal appearing caused by the outer space coming inside through the triangle exterior space, mixture of internal and external, and collecting environmental noises through the megaphone-effects, creates the complex relationships in a simple space. I wanted to design a house with universal factors, not being controlled by trends. 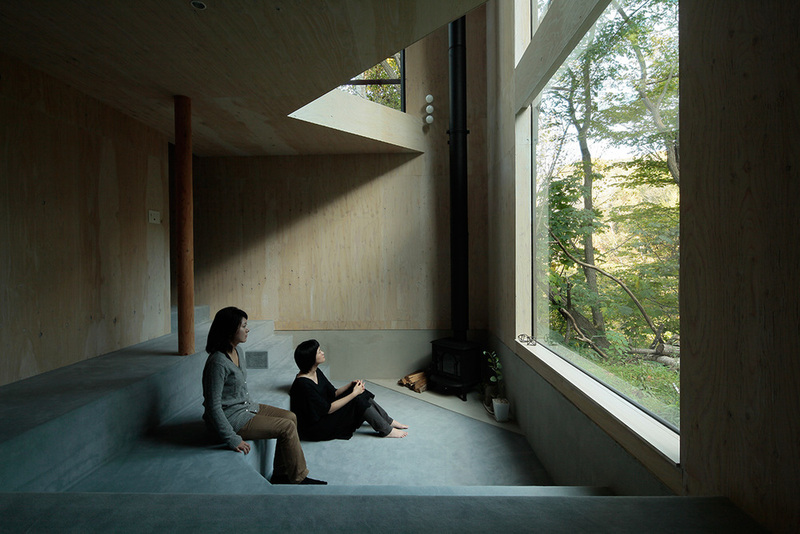 I can say this house is an "ordinary house" in our time, having a simple form and little mechanism. Although, I feel that I've learned so many lasting memorable aspects from "ordinary" residential projects by senior architects in the past. I believe that there are more to be discovered in "ordinary".